This entry was posted on Wednesday, December 8th, 2010 at 11:01 am	and is filed under delays, subway. You can follow any responses to this entry through the RSS 2.0 feed. You can leave a response, or trackback from your own site. I like how it currently shows 3 train like suspended, 3 delayed, 3 service changes, and two with good service right now. A little snow and MTA messes up. I like how it currently shows 3 train lines suspended, 3 delayed, 3 service changes, and two with good service right now. A little snow and MTA messes up. 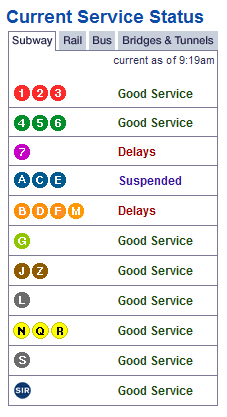 I like how it currently shows 5 train lines suspended, 2 delayed, 3 service changes, and 1 with good service right now. A little snow and MTA messes up!! I like how it currently shows 6 train lines suspended, 2 delayed, 3 service changes, and ZERO with good service right now. A little snow and MTA messes up! !